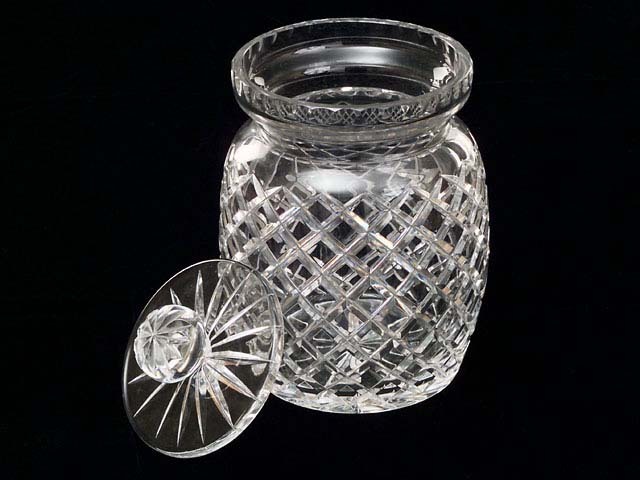 Cut Glass Ceskci Biscuit Barrel, 6 3/16" diameter x 8 1/4" tall at lip which is scolloped outside. Shaped similar to the Waterford Lismore Biscuit Barrel though rounded sides and diamond motif covers nearly full side suggesting pineapple. Top and base have 16 pt. stars and a 12 pt. star on knob on top. Ceskci maker's mark on the bottom....$55 Sorry! SOLD!! !